For many people, it is not always easy to identify payday loan benefits immediately. Designed purely for the short term and with higher interest rates than many forms of borrowing, opting for short-term credit is not always the best solution for everyone. In fact, it is recommended that these short term loans should only be used for emergencies. A loan should not be a regular form of borrowing (or indeed income). You should know exactly how, and when, you will be able to pay this money back. Yet despite these considerations. there are often payday loan advantages that make them very useful for consumers in certain circumstances. A person with a poor credit history might struggle to borrow money. Most providers of traditional consumer finance options will reject any high-risk applications. Individuals considered to be high risk might have struggled with debt in the past, though the high-risk category can also include people with no credit history at all. Payday companies do stringent affordability checks but have compensated for the high level of risk by charging higher levels of interest than other UK lenders. As a result, they can often accept loan applications that other types of lender will not. In the majority of cases, the application process for finance is done entirely online. In exceptional circumstances, further types of evidence may need to be provided. For most people, applying for a credit involves nothing more than completing an online form with personal and financial details. These details are secure and will not be passed on to third parties, but they will be used by the lender to make a quick decision. Most borrowers choose to manage their borrowing online. This is one of the payday loan benefits that can make them easier to control. When you apply for a payday loan, you are typically given access to a personal online account. When you log in, you can see your current loan balance and any repayment dates, as well as having the option to make an online payment. Managing your loan online makes it easy to make early repayments if you have the money available. Making use of various modern technologies, many lenders will send payment reminders by text or email. This can help you to ensure that you have money in your account to cover payments that are taken automatically using a Continuous Payment Authority. If your car breaks down or the boiler needs replacing, you may not have time to wait for a traditional form of borrowing to be approved. As well as offering online forms to save you from a trip to a physical store, many lenders can transfer the money to your account within minutes of a successful application. Pounds to Pocket, for example, advises that most loan decisions are made within 30 minutes, with money sent to the borrower’s bank account within 10 minutes of approval. Benefit 6: You can use the money for anything that you need to use it for. There are currently no restrictions on the use of loans. That said, it is strongly recommended by everybody in the industry that you only use your short term finance for absolute life essentials and emergencies. Default fees, overdraft fees, bounced cheques and other charges can quickly mount up. By taking out finance to cover expenses that you cannot afford, you may reduce the amount that you pay overall. You should only do this if you are sure that you can repay the loan by the end of its term. You might be about to miss a credit card minimum payment and may also be in an unauthorised overdraft by £20. Taking out a £100 loan could allow you to make your credit card payment (saving you from a late payment fee of potentially £25) and could enable you to pay off your unauthorised overdraft (saving you up to £100 a month). Meanwhile, thanks to strict regulations put in place by the Financial Conduct Authority, borrowing £100 from a lender would never cost you more than £24 in interest over the course of a single month. FCA regulations also ensure that you will never pay back more than double the amount that you originally borrowed. Instead of paying £125 in charges and fees alone, whilst still owing your credit card payment and being £20 into your overdraft, the same amount of money could have paid off these two debts if you took out a short term loan. Some forms of credit can put you into debt for more than 12 months. Other payday loan benefits are that they are intended to be borrowed over very short periods of time – days or weeks – and will not hang over you for years. Short term finance is available outside traditional banking hours. The online application process provides the opportunity to borrow money at any time of the day or night. You can also manage your loan 24/7, making repayments or checking your balance as often as you like. The Financial Conduct Authority closely monitors the payday industry. Lenders need to register with the Financial Conduct Authority before they can carry out any restricted activity (such as providing a loan or offering a loan broker service). Once approved, they will feature on the Financial Services Register. Consumers applying for short term credit can benefit from the security that the Financial Conduct Authority provides. Borrowers should always search the Financial Services Register, checking that they are working with an approved company before making a loan application. The FCA has ensured that interest rates for loan products are capped at 0.8% per day. This is 80p per £100 per day or roughly £24 per month on top of the original borrowed amount. For comparison, some unauthorised overdrafts can cost as much as £100 per month in fees, on top of the £100 borrowed. The FCA also introduced a total cap, which means that consumers will never pay back more than double what they originally borrowed. If you received a £100 loan, you would never pay back more than £200 with interest and fees added on. Meanwhile, overdrafts are not subject to the same limitations. The costs of an overdraft can continue to mount up until it is paid off in full. Banks can even charge fees on authorised overdrafts that will push you into unauthorised borrowing, where the charges are much higher. Bank overdraft fees can be added month after month, so that the cost of borrowing £100 can continue to grow, almost without limit. You will be provided with clear information about the overall repayment amount, any monthly instalments (if your loan is to last for longer than a month), and of course – your repayment dates. You can then adjust the amount that you are borrowing, or the length of your loan term, to tailor your financing to your needs. It is recommended that you borrow exactly the amount that you need. Not borrowing enough can leave you with further expenses elsewhere, which can cause financial difficulty, whilst borrowing too much will likely lead you to pay unnecessary interest on money that you do not need. If you do borrow more money than you need, most lenders will allow you to repay early without any additional charges. You might find that your application is accepted, even if you have a poor credit history. You can manage your borrowing online, checking your remaining balance or making repayments at your convenience, anytime, day or night. Borrowing options are available relatively quickly, making them suitable for emergencies. You might be able to apply for finance and receive the money, within an hour or two. These loans can be spent on anything that you would like to use the money on, though it is recommended that they are only used for emergencies and essentials. Short term credit could (in extreme cases) even save you money. Other forms of borrowing and missed payments, can become more expensive overall. Payday borrowing is a short-term form of credit. It will not be hanging over you for years. They are very strictly regulated by the Financial Conduct Authority. This protects you, as the consumer. Strict caps on fees and interest ensure that you will not be charged excessively for your loan. Borrowing is consumer-controlled. You choose the amount of money that you borrow and the amount of time that you would like to repay your loan over. You will be clearly shown how much you will need to pay in total, along with each instalment amount. You can make an informed decision to borrow money. 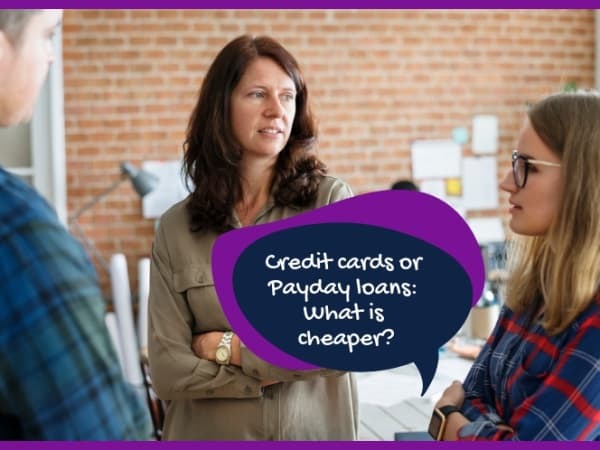 Credit cards or Payday loans: What is cheaper?